When I was making a decision on what I wanted to major in college, a friend suggested interior design rather than architecture due to the amount of years it would take to complete my degree. At the time I agreed with her but have always questioned that decision based on my love of architecture. While attending school I worked at the Design Center in Downtown Philadelphia and also helped numerous friends and family with the interior design of their homes. In 1980 I moved from Philadelphia to Tampa where I opened and operated an art gallery and did a few interior design projects. I returned to Philadelphia in 1981 and worked for 3 years doing a lot of interior design work for commercial businesses and continued helping friends and family with their home designs. 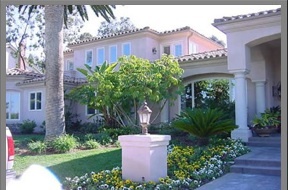 In 1985 I moved to San Diego and continued to work in interior design on a part-time basis while focusing on building my landscape design business. I offer a free one hour consultation to any perspective new client.